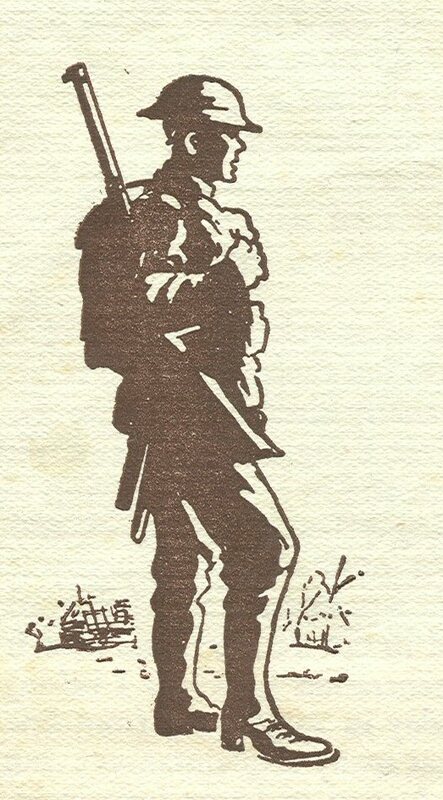 This week: two works by J.B. Priestley which tell the story of his experiences in the First World War in very different ways. 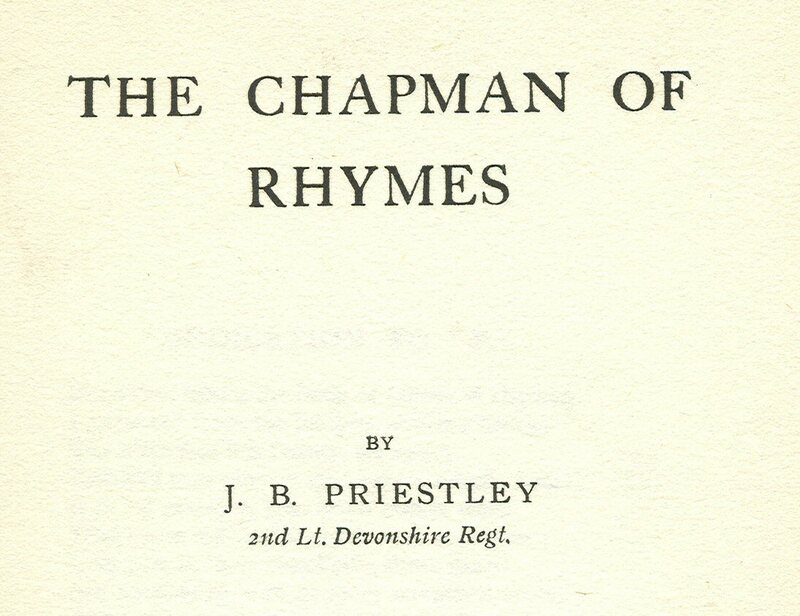 The first, The Chapman of Rhymes, is a little book of verse published in 1918. At the time, Jack Priestley had been serving in the British Army since volunteering in 1914 for the Duke of Wellington’s West Riding regiment; he later became an officer in the Devonshires. Priestley had endured the full horror of the Great War, and had been seriously wounded twice, in a dug-out collapsed by a trench-mortar, and later in a gas attack. The poems in Chapman do not reflect Priestley’s war experiences. They were written earlier, part of his juvenilia (Object 12). Unlike his later works, there is no sense of his personality or background. The verses resemble the works of late 19th century poets such as Alfred Austin and Austin Dobson, with mock medieval subject matter and choice of language (e.g. “shoon” for shoes). There are also echoes of Swinburne, Kipling, William Morris and de la Mare. Chapman, despite its pre-War content, brings home the reality of Priestley’s war experience. He did not expect to survive and become a successful author, represented by many published works. 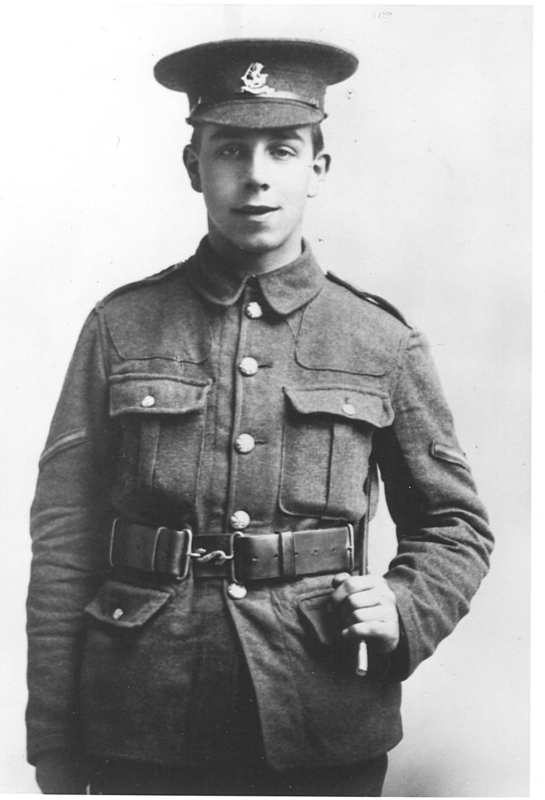 He thought that, like all his Bradford boyhood friends and Company comrades, he would be killed. So he had the verses published, “entirely at my own expense, during that war when I felt, foolishly, I ought to leave something behind”. Later, Priestley regretted the publication: as he put it: “still alive and coming to my senses, I destroyed every copy I could lay hands on, now well aware of my folly”. He realised that his literary talents were better suited to essays, novels, journalism and above all drama. To respect his wishes, I decided not to seek to quote from Chapman here. “The British command specialised in throwing men away for nothing. The tradition of an officer class, defying both imagination and common sense, killed most of my friends as surely as if those cavalry generals had come out of the chateaux with polo mallets and beaten their brains out. Call this class prejudice if you like, so long as you remember … that I went into that war without any such prejudice, free of any class feeling. No doubt I came out of it with a chip on my shoulder; a big, heavy chip, probably some friend’s thigh-bone”. (Thank you to John Brooker for a useful discussion about the style of Chapman. Priestley quotations from Instead of the Trees and Margin Released. More about JBP’s WW1 experiences in “J.B. Priestley’s Service in World War 1”, my chapter published in Bradford in the Great War, and Priestley’s Wars, published by Great Northern. This entry was posted in Bradford, History, Literature, Priestley, JB and tagged Autobiographies, Bradford, First World War, Literature, Poems, Priestley. Bookmark the permalink.